This latest volume of H. P. Lovecraft’s complete unabridged correspondence is unique in that it contains a substantial amount of letters by one of his most distinctive later colleagues—the weird writer C. L. Moore, whose stories mingling fantasy and sexuality were among the most striking contributions to Weird Tales in the 1930s. Lovecraft’s letters to Moore survive only fragmentarily, but Moore wrote more than 60,000 words of letters to Lovecraft, and these are now published for the first time, revealing a vivid imagination and keen analytical mind who held her own in debates with her older colleague. Lovecraft introduced Moore to her future husband and writing partner, Henry Kuttner, whose own brief correspondence is included here. Fritz and Jonquil Leiber were already married when Jonquil wrote to Lovecraft, as Fritz was too shy to approach him. There ensued a lively correspondence with both individuals that lasted less than a year, but was filled with profound discussions of the nature of weird fiction. Lovecraft wrote a long, detailed letter analyzing Leiber’s early novella “Adept’s Gambit,” and Leiber revised the story accordingly. Lovecraft also engaged in a short correspondence with Harry O. Fischer, who initially collaborated with Leiber in conceiving the Fafhrd and Gray Mouser series of fantasy tales. This volume also prints the complete letters to a little-known correspondent, Frederic Jay Pabody. These letters have surfaced only recently, and they show Lovecraft at the height of his powers as an intellect: he conducts a searching dissection of the classic weird tale “Thurnley Abbey” by Perceval Landon; he is also unremitting in his condemnation of pulp hackwork. As with other volumes in this series, the letters have been meticulously edited and annotated by David E. Schultz and S. T. Joshi, with an appendix containing rare material by Moore, Kuttner, and Leiber. H.P. 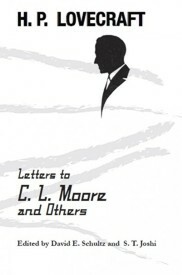 Lovecraft: Letters to C. L. Moore and Others.. By H. P. Lovecraft, Edited by David E. Schultz and S. T. Joshi. New York, NY: Hippocampus Press; 2017; ISBN 978-1-61498-196-1; paperback, 414 pages.